Join 38000 others & follow Sean Hull on twitter @hullsean. MySQL DBAs are in greater demand now than they’ve ever been. While some firms are losing the fight for talent, promising startups with a progressive bent are getting first dibs with the best applicants. Whatever the case, interviewing for a MySQL DBA is a skill in itself so I thought I’d share a guide of top MySQL DBA interview questions to help with your screening process. It’s long and detailed with some background to give context so I will be publishing this in two parts. In the Oracle world of enterprise applications, the DBA has long been a strong career path. Companies building their sales staff required Peoplesoft or SAP, and those deploying the financial applications or e-business suite needed operations teams to manage those systems. At the heart of that operations team were database administrators or DBAs, a catchall title that included the responsibility of guarding your businesses crown jewels. Security of those data assets, backups, management and performance were all entrusted to the DBA. In the world of web applications, things have evolved a bit differently. Many a startup are driven only by developers. In those smaller shops, Operations tasks are designated to one developer who takes on the additional responsibility of managing systems. In that scenario, Operations or DBA duties becomes a sort of secondary role to the primary one of building the application. Even in cases where the startup creates a specific operations role with one person managing systems administration, chances are they don’t also have DBA experience. Instead, these startups are more likely to manage the database as a typical Linux application. Where do they come from, and why don’t a lot of computer science folks gravitate towards operations, and DBA? This may be in part due to and the romance of certain job roles which we discussed in a past article, The Mythical MySQL DBA. This pattern appeared a lot in the Oracle world as well. Many folks who were career DBAs actually moved to that role from the business side. In fact you’d find that many didn’t have a computer science or engineering background in the first place. In my experience I saw many Linux and Unix administrators with a stronger foundation who would fit into the DBA role but were simply not interested in it. The same can be said of the MySQL side of the house. Computer science grads don’t get out of school aiming for a career in ops or as a DBA because it has never been regarded as the pinnacle. It’s typically the PROGRAMMERS who become the rockstars in a cool startup. But as the Internet grows into a richer and more complex medium, things are changing. People talk about scalability, high availability, zero downtime and performance tuning. When brief outages cost millions in losses expectations are very high and that requires skilled, experienced DBAs. We’ve made a list of comprised of skill questions, general questions and ‘good-to-know’ questions. Have fun grilling your candidate with them, although bear in mind that with interviews it’s not about knowing it all, rather how the person demonstrates critical thinking skills. Why are SQL queries so fundamental to database performance? Indexes — too many, too few; what’s the difference? Feeling like a MySQL expert yet? 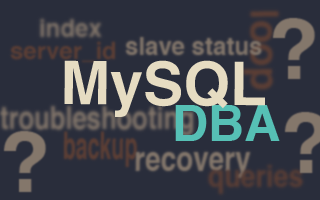 In Part 2 of Top MySQL DBA Interview Questions we’ll walkthrough four more questions plus a bonus. Originally published at Scalable Startups.